The new Sparks Racing Yamaha Raptor Full Exhaust System is awesome. The power gain over stock is tremendous. The whole system whole weighs about 7 lbs., which is 7 lbs. lighter than the stock system. The power gain is across the entire range. The aluminum silencer helps reduce weight, looks great and makes the Raptor sound like a true four-stroke performance machine. Don't let anyone tell you that the stock header is good. For reference, the diameter of the stock head pipe is the same size as the Sparks 400X X-4 exhaust system. Trying to squeeze 660cc into an exhaust that works well for a 400cc motor won't maximize power. We have done some testing against some of the exhausts on the market, including the exhaust system that is claiming 15hp gain, and the Sparks exhaust has out performed all of them. This system is a must for every Raptor owner! The X-6 is awesome for the big bores and highly modified motors. 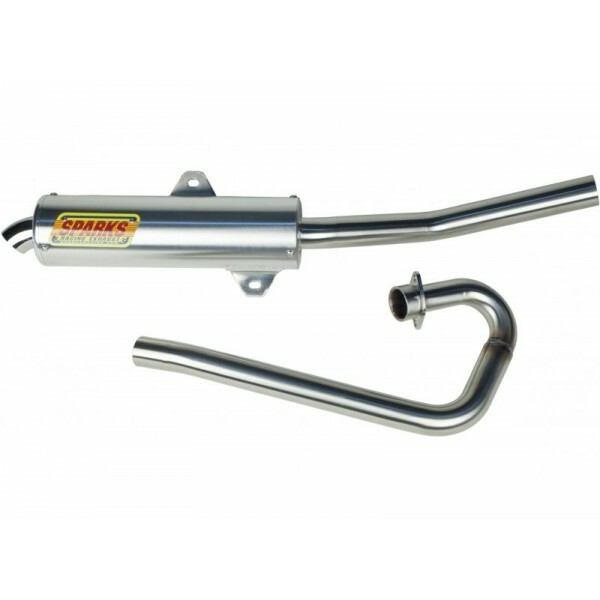 The Sparks Racing X6 Stainless Steel Exhaust system is the ideal exhaust system for any application because of the power gains it produces through the entire power curve. Their exhausts are complete systems, not slip-ons, because they’ve found much more performance with designing a complete system rather than working with the limitations of the stock head pipe. Some aftermarket exhaust systems are able to be used as a slip-on or complete system, but the problem is they’re still limited to stock diameters where the head pipe and rear section come together. They spent countless hours dyno testing, on the track with Pro-level riders and at drag races to ensure the most performance possible out of their exhaust systems. This exhaust system is offered in both the X6 Race Core and X6 Big Core systems. The X6 Race Core features a 2” outlet diameter which offers the best all-around performance and can be configured with a spark arrestor and quiet inserts. The Race Core system is about 102dB using SAE testing guidelines. The Big Core exhaust system houses a 2.25” outlet diameter which offers more top-end performance on built engines. The Big Core is about 110dB using SAE testing guidelines. The Big Core cannot be configured with any quiet inserts. A spark arrestor can be installed in the Big Core system, but the Big Core was never intended to use a spark arrestor, so running a spark arrestor in the Big Core will drastically shorten the arrestor’s life span.